Newcan is proud to announce its Gastonia, NC plant has been assessed and registered against the provisions of ISO/TS16949:2009. The aim of ISO/TS16949:2009 is a quality management system that provides for continual improvement, emphasizing defect prevention and the reduction of variation and waste in the supply chain. TS16949 applies to the design/development, production and, when relevant the installation and servicing of automotive-related products. ISO/TS 16949:2009 is an ISO Technical Specification, which aligns existing American (QS-9000), German (VDA6.1), French (EAQF) and Italian (AVSQ) automotive quality systems standards within the global automotive industry, with the aim of eliminating the need for multiple certifications to satisfy multiple customer requirements. Together with ISO 9001:2008, ISO/TS 16949:2009 specifies the quality system requirements for the design/development, production, installation and servicing of automotive related products. In addition, there are customer specific requirements that are required by individual subscribing vehicle manufacturers. This standard was designed and intended to replace QS9000 which ceased to exist as of December 15, 2006. Each Newcan facility independently assessed and registered. 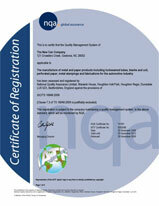 Copies of the certificates, issued 30 November 2006, are available if needed. If you have any questions regarding this quality standard or require any information, please contact Newcan and we will be happy to assist in any way we can.